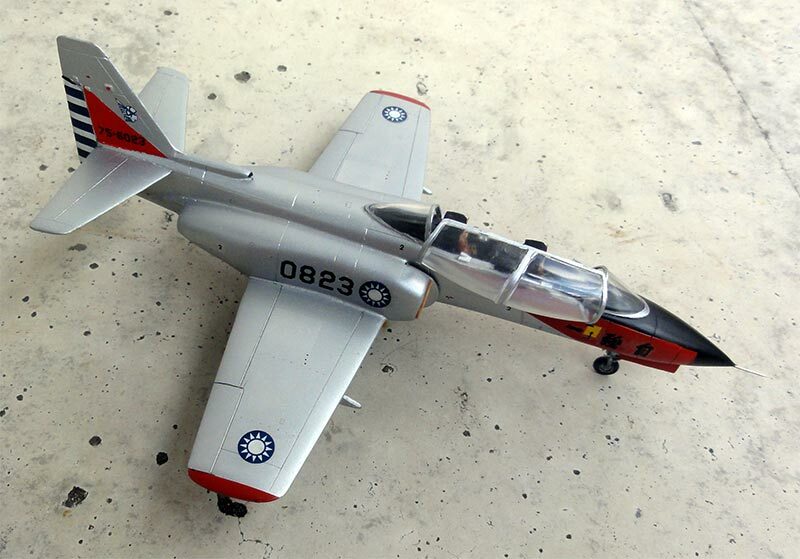 In the nineteen seventies the Taiwanese aircraft industry together with Northrop developed an advanced jet trainer, the AT-3. It first flew in 1980. Manufactured by AIDC (Aerospace Industrial Development Corporation), some 62 aircraft were produced solely for the Taiwanese air force. 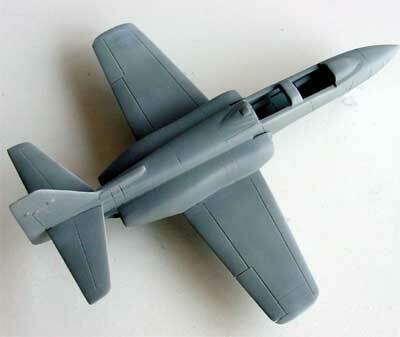 It could be lightly armed as well with gun pods and Sidewinder / TC-1 missiles. 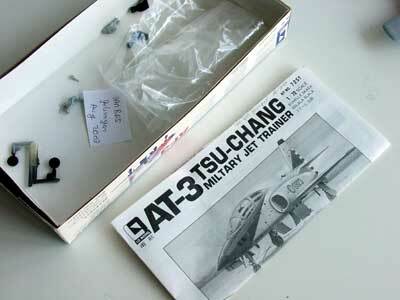 In 1/72 scale there is a very basic model from a "Lo model" no. 001 which seems to be Taiwanese. The parts are simple but all right. 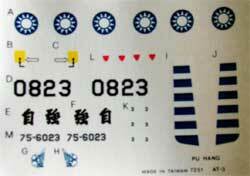 Decals are for a ROCAF aircraft, probably of the prototype. 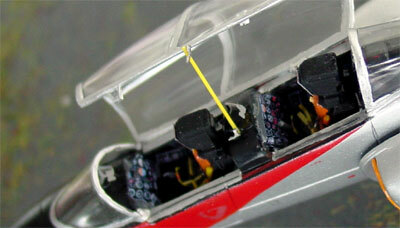 After basic assembly, some thick panel lines were filled in some places with putty. after sanding, a first coat of light grey was air brushed to check for any flaws. It seemed OK.
Gearbays are not deep, but there is some tiny raised detail. 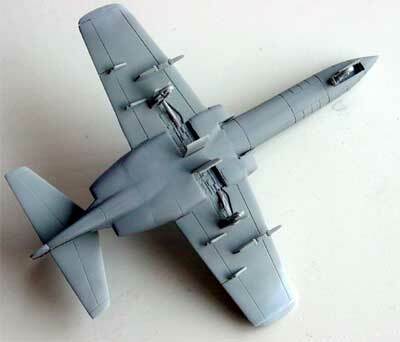 The overall model got a coat of aluminium applied with the airbrush. The anti-glare panel was masked and painted black. The decals were a bit sturdy but imposed no problems, but make sure to dip them in Johnson Future to get a better adhision. The red panels on the nose were airbrushed, the tail panel was made from an also sprayed decal in the same red colour and cut to shape. There is almost no kit interior, so with bits and pieces from card and the spares box, a cockpit was made. Instrument panels were made suing my home made instrument decals which I use now and than when these are missing from a kit decal sheet. Seat gear was painted orange with seat straps. The canopy is not very clear but was set opened up. On the air intakes, some covers were set as they are very undeep. 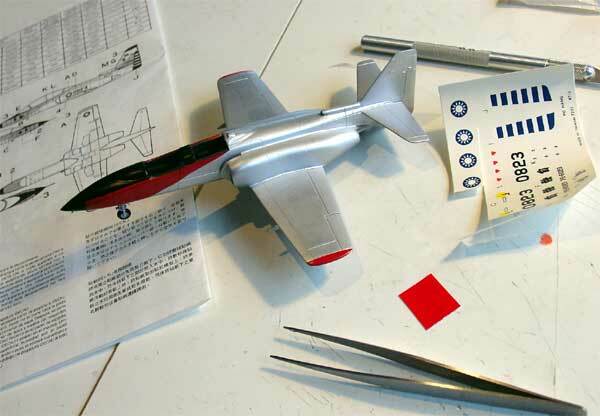 A nose pitot made from a metal needle was added to the nose. Finally, the whole model got a sealing Johnson Future coat airbrushed on to it. 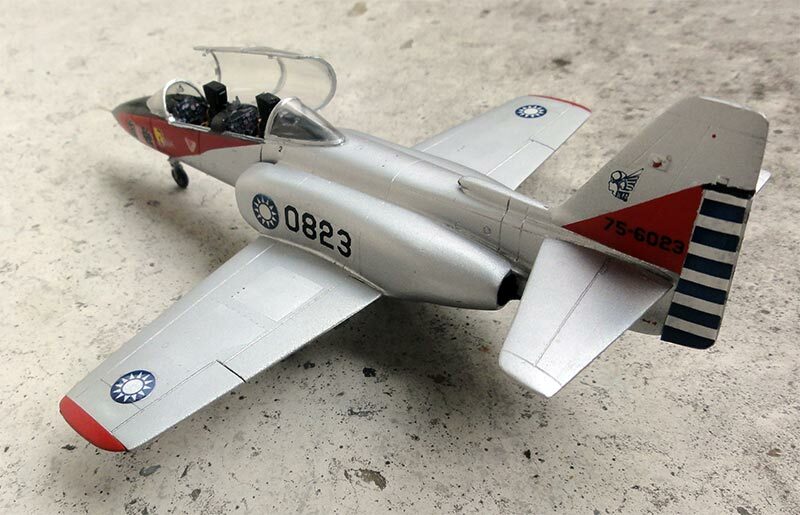 That completed this Far east and very unknown jet trainer which sits nice next to other trainers like the Hawker Hawk and Pakistani/ Chinese K-8 Karakorum. 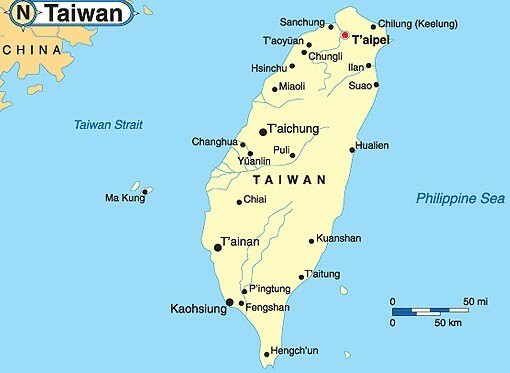 Taiwan, the large island off the coast of mainland China was a democratic area established in 1912. The larger region saw many battles with Japanese occupation of Northern China Mantschuria with later the Second World War. After the end of the war conflicts remained with the Chinese civil war with mainland China becoming a Communist continent. But from 1949 Taiwan was able to remain the only independent area with leadership of general Chiang Kai-shek. It was the Cold War with local conflicts in Korea and Taiwan (ROC) was strongly supported by the USA. The armed forces air force got American aircraft such as the F-104, F-5 and T-34. 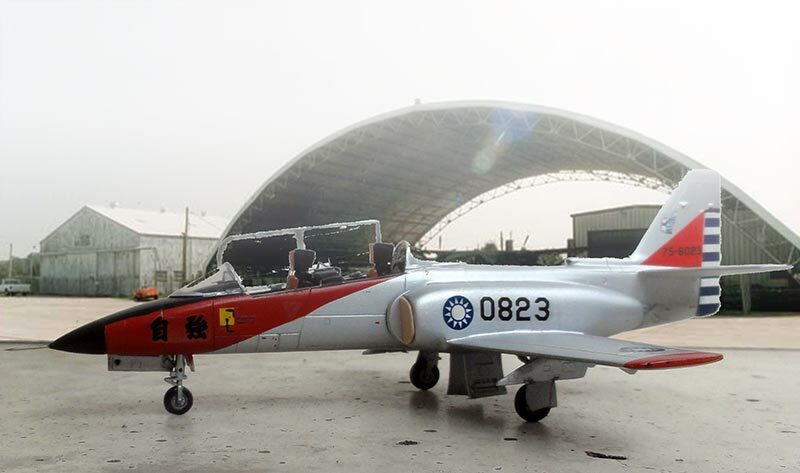 The local industry also developed some aircraft, such as the AIDC AT-3 jet trainer of which development started in the 1970s and flew in 1980. More recent aircraft types are the F-16 but also French Mirage 2000. The latest local designed aircraft is the F-CK-1 Ching-kuo "IDF"multirole fighter. The army and navy also use helicopters and aircraft like the P-3 Orion and still even S-2 Trackers. 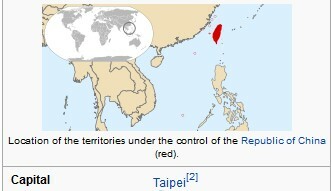 Still as of today, Taiwan is considered by China to be their province with still difficult relations. 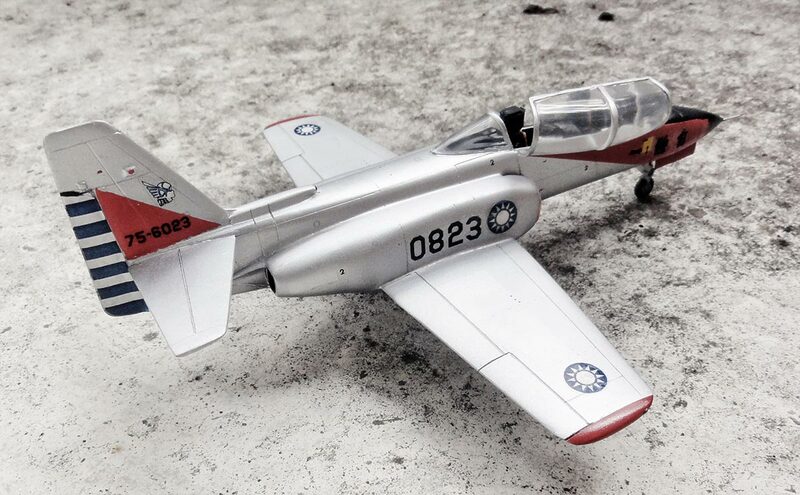 AT-3, coded 0823, c/n probably 75-6023 and was 74-6023 of Taiwan AF. So this is a simple straight out of the box AT-3 built for the 1/72 scale collection.